LGBTQ+ and expat communities are both incredibly diverse, not only in terms of sexual orientations and gender identities but as multinational spaces showcasing different systems of belief, racial and ethnic backgrounds, and socioeconomic circumstances. The intersection of these beautiful differences is a big part what makes our community so vibrant and inclusive. As such, it is important that we keep abreast of inequalities that exist within our communities, be aware of any implicit systemic advantages we may have, and advocate for those who are facing multiple types of discrimination. On the anniversaries of major Civil Rights Movement events in United States, as well as current national politics, race issues have made their way back into the spotlight. These issues have become more interconnected with feminist and LGBTQ+ movements as a focus on intersectionality – the intersection of the discrete parts of one’s identity like, race, religion, ethnicity, disability-status, sexuality, and gender – which requires one to be more aware of how those identities that are socially disadvantaged can become increasingly stacked against certain individuals or groups. These categorizations also indicate the way in which race issues, for example, can still be present in spaces where gender or sexual identities may be the same. As governments, businesses, and organizations are not exempt from having to confront issues with discrimination the LGBTQ+ community should take the initiative to combat discriminatory ideology that may find its way into those spaces. In fact one could argue that in western nations, like the United States, racism has more than made itself present in the lives of LGBTQ+ individuals who are also non-white. This by no means that all white gay men, for example, are racist, but because you or I are racist does not mean we should not work to make ourselves aware of issues in our community and help those around us who may be facing different forms of prejudice. Speaking to my specific expertise, one group that has been particularly under-discussed in relation to race in the United States are gay Asian Americans. Making up a swathe of individuals whose ethnic heritage finds its root in one or more of over a dozen nations in South, Southeast, and East Asia, Asian Americans are by no means a homogeneous entity in terms of culture, social norms, or ethnicity. To understand the plight of gay Asian Americans one must first look back on the retaliatory structures that were first used against Asian migrants to the United States in the late 19th century. Like most groups immigrating to the United States, individuals sought a better future for themselves and their families, largely in pursuit of economic prosperity or escape from oppressive regimes. Marked by anti-Asian immigration legislation as well as the birth of an openly racist media movement that sought to destroy the image of Asian immigrants by both demonizing and subverting their social status called “Yellow Peril” journalism, the turn of the 20th century was certainly not ideal for non-white individuals. This movement birthed a lot of orientalist notions that have persisted today, from that Asians are more feminine and subservient (applied to women) to the size myth. These blatantly racist publications have their toll, and certainly is not the last time powerful individuals or supposed new sources have scapegoated racial minorities for their own agenda. Racialized propaganda is largely meant to enforce whiteness and, in the case of the US, western masculinity. A lot of racially charged discourse, in relation to gay Asian Americans has been being used to undermine Asian American masculinity. The discourse of visual and written media co-opt stereotypes surrounding race and masculinity by means of reinforcing social and cultural ideas through contact with consumers. But these ideas have not only found their way into the lives of heterosexual individuals, they have found their way into the LGBTQ+ community as well, through application of these same notions onto gay Asian Americans. What are these ideal associations in terms of masculinity? There is some flexibility but physical strength and muscle that may accompany it, typically macho (“straight-acting”) behavior, maybe some amount of body hair, prominent physical features (e.g. , jaw-line, brow, nose, broad shoulders, and being tall), and media advertising would portrays white predominately. Most of these features are entirely genetic, out of the hands of an individual who does not have all of them, and with media having already moved them into a feminized category its hard to stand against these more subversive ideas about masculinity – and in some cases what is standard, or typically attractive. Gay Asian American men are given the same characterizations. In outlining the background of Asian American men, before moving on to discuss gay Asian American men, Voon Chin Phua in “Contesting and Maintaining Hegemonic Masculinities: Gay Asian American Men in Mate Selection” delineates the western understanding of masculinity as well as the current social perceptions held by Asian American men without regard to a specific sexual orientation. These same associations with social implications of emasculation carry over into the social understanding of gay Asian communities. Social stereotypes that subvert gay Asian Americans societal placement against the white standard of western masculinity follow similarly to those mentioned above in historical and physiological terms but "gay Asian American men also contend with nonphysical stereotyping. These nonphysical characteristics, such as being intelligent, shy, exotic, sexually passive and respectful, generally depict a lack of manly bearing” (Phua 913). Media is not the only factor in such associations however, nor does it distinctly quantify how potentially engrained some of these ideas are in US society. In order to be both more informed and more aware of the way race issues can become socially entrenched into society looking at contemporary work in social psychology and sociology on the issue may help further quantify the existence of racially stereotyped understandings of individuals within the LGBTQ+ community. An interdisciplinary communications and social psychology experiment conducted at the University of California, Los Angeles, “Intersecting Race and Gender Cues are Associated with Perceptions of Gay Men’s Preferred Sexual Roles” by David Lick and Kerri Johnson sought to evaluate whether or not “perceivers endorse distinctly gendered beliefs about racial groups, indicating that Black individuals are masculine and dominant whereas Asian individuals are feminine and submissive.” This study is one of the more concise quantitative studies showcasing the extant perpetuations of stereotyping that face gay men of color in US society, especially those with Asian and African ethnic backgrounds. 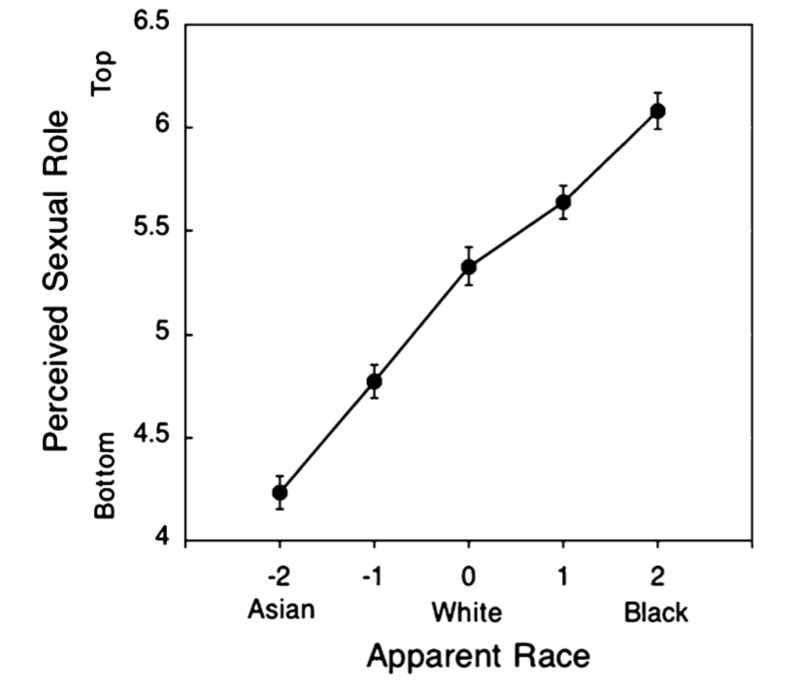 The study’s data showed that individuals from the United States tend to associate visual cues of apparent Asianness and blackness with that of femininity and masculinity respectively (see figure 1). Visualization of data on US perceptions of masculinity and femininity when applied to race-based visual cues. In this particular instance, racial conceptions of Asian Americans as well in combination with contemporary media representations have been tailored to enforce these notions onto Asian Americans members of the gay community, while conversely presenting Black men as sexually aggressive and hypermasculinized. Within this conceptualization lies a more subversive issue specifically among gay men, which strips racial minorities of their choice in sexual expression and preference. This notion surrounds the assumption of one’s sexual positioning preference based on their race, which is to say a generalized assumption that Asian Americans – in the broad ethnically and racially reductionist sense – are “bottoms” or that African Americans are “tops” without consideration for an individual’s actual role preferences; this is something that has sociopolitical implications beyond mere sexual positioning. The problematic western perception of superiority and importance attributed to traditional masculine qualities is particularly oppressive to the idea of being feminine. Sexual positioning in the western gay community emphasizes the disparity in societal preferences towards masculinity that actively vilifies the feminine, placing one’s sexual preferences into broader dominant (masculine) versus passive (feminine) categories. This connection of anti-feminine sentiments and the power dynamics of sexual positioning is not one made lightly, as David Lick and Kerri Johnson’s results also show that assumptions of femininity and masculinity directly correlated with assumptions of sexual positioning based on the same visual cues amongst gay males from the United States (see figure 2). Notably white visual queues on both graphs are perceived as largely neutral, which gives individuals – like myself – the liberty to utilize my masculinity and our sexual positioning preferences without having to fight against any presumptions – a freedom that should be extended to everyone. Visualization of data on US perceived sexual roles when applied to race-based visual cues. The combination of the historical factors that have the groundwork for the negative perceptions that social psychologists and communication experts have quantitatively shown to be still present in the United States. The sociological implications of stereotypes specific to both Asian American and African American gay cis-men and survey data demonstrating that an astounding 85% of the LGBT Asian Pacific Islander community has faced discrimination based on race and 44% have been actively discriminated against based on their gender expression (being too butch/too feminine) are clear indicators of an existing issue with assumptions based on race. While the data cited here comes from US sources specifically, it is likely that these notions are not exclusive to the United States but are rather pervasive across western LGBTQ culture and society. re clear indicators of an existing issue with assumptions based on race that have become more subtly entrenched in US society. With this in mind, a part of making our community a more open and accepting place lies in moving past these assumptions and spreading awareness of these issues to those we know. Not everyone carries such assumptions, and many gay white men have advocated for causes like the Civil Rights Movement and issues facing trans women of color but such advocacy comes from a place of both openness and an informed understanding of injustice and systems of prejudice that we are already aware of as members of the LGBTQ+ community. Systemic issues are generally more of a challenge to tackle, as their seditious nature is one that for some can go completely unrecognized as potentially discriminatory or as a micro-aggression against an individual. But with an awareness of one’s personal advantages– like being a white male in the gay community in the US, versus being an Asian male in the gay community in the US – we create a more empathetic space where we can begin to listen to one another, or similarly be supported by our community in areas that we ourselves might be disadvantaged. Standing alongside, rather than in opposition to, our LGBTQ+ brothers and sisters is what moves us together into a brighter future. Scroll down to comment and let us know what you think?